This 8-track demo CD was discovered in June 2009 when it was auctioned on eBay. According to the seller, the CD dates from 1998 and was the first demo with Chester Bennington in the band, which was given by the band's manager to an high executive of Warner Bros. Records. This information is wrong for many reasons: Chester joined the band in 1999, Linkin Park signed their first contract with Warner in November 1999, and "She Couldn't" samples the song "B-Boy Document '99" by The High & Mighty which was released in the summer of 1999. That puts this demo CD in the timeframe between the release of the Hybrid Theory EP and the 6-track demo CD, which still makes it some of the earliest demo material from the band. "Crawling" was re-recorded with new instrumental and vocal takes. Lyrically, it's almost the same as the 9-track demo version, but without "Ah! I hate you so much right now!" being yelled at the beginning. "She Couldn't" goes against a lot of stereotypes regarding early Hybrid Theory/Linkin Park material. The song clocks in at over 5 minutes in length, and features an extended instrumental breakdown. It's also one of the softest songs the band has produced, particularly from this era. This is also an extremely rare case of a Linkin Park song sampling music from another artist (which may be part of the reason it was scrapped so early on the process). "Carousel" and "Part Of Me" are both different from the 9-track demo versions, featuring different vocal parts, including some different lyrics. The intro on "Part Of Me" is also slightly longer than its previous versions. 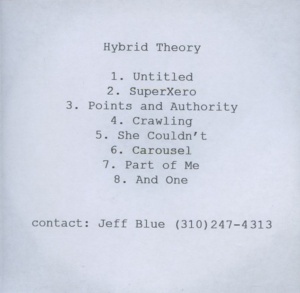 "Untitled", "Points And Authority", "SuperXero", and "And One" are all identical to their counterparts on the 9-track demo. This CD offers some insight into where Hybrid Theory was as a band at this point, still a year or so away from the release of their debut album. The quality of the songs in general isn't good. The last 3 tracks in particular are hindered by a lot of static. Copies of the CD were obtained by fan site LPLive and made available for free download on July 1, 2009. This page was last edited on 9 February 2017, at 16:02.